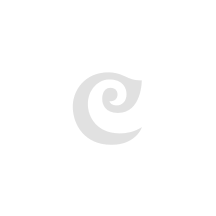 Buy Designer Crepe Sarees @ Craftsvilla! Out of all the outfits, saree is one outfit that strikes a complete balance of elegance and sensuality. A woman can not only carry all the traditions gracefully in a saree but she can appear as sensuous as she chose to be when draped in a silky soft falling saree. Latest crepe saree collection at Craftsvilla has everything desired by an Indian fashion conscious woman. Check out the crepe saree collection online and select some of the most beautiful pieces for yourself. Play With Colours And Patterns! Colours and patterns used in the crepe Saree Designs at Craftsvilla are very unique and the latest. All the colours and patterns are arranged to bring out the best in you. Designers have experimented with new and bold colours. All the women who love to experiment with the fashion will get some exquisite pieces to choose from this crepe saree collection at Craftsvilla. Sea green, turquoise, mauve and magenta are the colours in the trend. Fashion stylists are pairing these beautiful and trendy colour sarees with diamond and Kundan Jewellery in order to give a royal look. The designers are not only playing with the colours but crepe saree patterns are also unique and different. Geometric designs and paisley prints have found their space on bridal crepe sarees. If you have your wedding or a wedding in the house round the corner then don't forget to try one of these exotic crepe sarees from Craftsvilla. Apart from geometric designs, designers have also used digital prints and stone work on the crepe sarees. 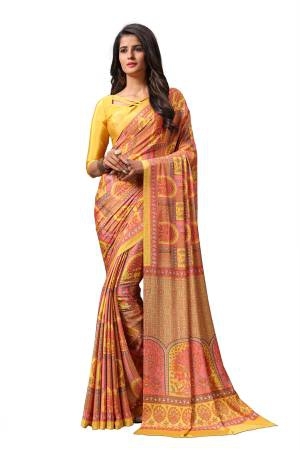 Digital prints colours and designs are enhanced by many folds when done on buttery soft and free flowing crepe sarees. All-time favourite floral prints will definitely touch the woman in you as you drape the soft cloth around you. Discounted Crepe Sarees Apt For Every Occasion! Crepe saree collection for sale at Craftsvilla is apt for each and every occasion. 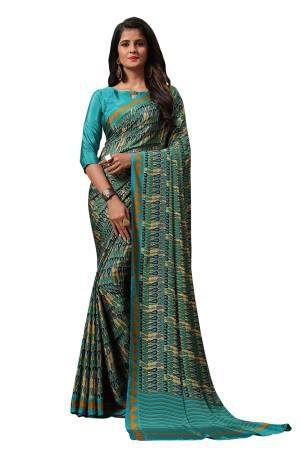 You will find use of bold and solid colours along with animal prints in party wear crepe sarees at a discount. Traditional maroons, reds, peaches and pinks are ever green if you wish to flaunt the saree in a family function. Apart from that, you will get plethora of choices to choose from for almost every purpose where you need to wear a saree. 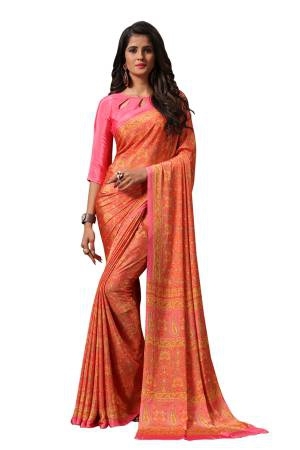 Nothing can look more elegant than a nicely draped affordable crepe saree if you are a business woman and often need to attend business meetings.